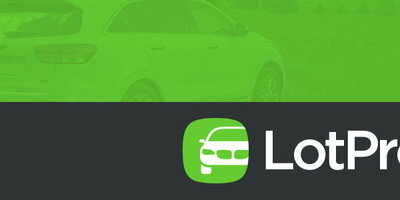 The Korean brand borrows a page from Toyota's playbook by creating a sub brand offering a combination of hybrid and electric models for 2017. 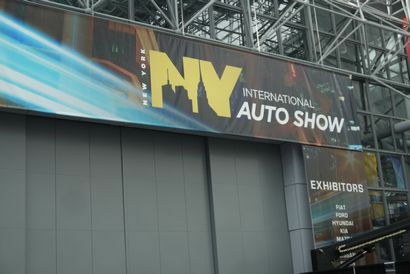 The doors to the 2016 New York International Auto Show may have closed this past Sunday afternoon, but the effects from at least a handful of vehicles that were introduced at this year's show will be felt for years to come. Not the least of those intros was a trio of vehicles from Hyundai – an automaker that has taken a page from Toyota's playbook by creating a separate brand for a lineup of fuel-efficient vehicles. Unlike Toyota, however, which chose to gradually expand the number of Prius models, Hyundai has jumped in with both – make that three – feet. Although all three share the same platform architecture and hatchback body (rest assured, there will be more body styles to follow), the initial lineup comes to market offering buyers a wide spectrum of powertrain choices. 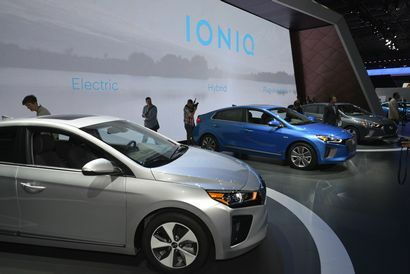 Mike O’Brien, vice president of Corporate and Product Planning for Hyundai Motor America put it this way, "Ioniq will attract an entirely new group of eco- and efficiency-oriented buyers in the U.S. market. 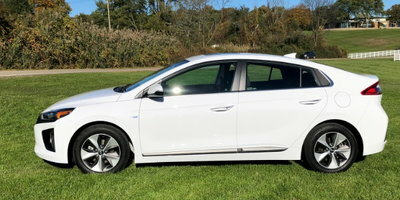 With outstanding powertrain flexibility, design, connectivity, and advanced technologies, Ioniq meets the needs of a large and growing group of buyers needing a highly efficient, low-emissions vehicle without compromise to their daily lifestyles." 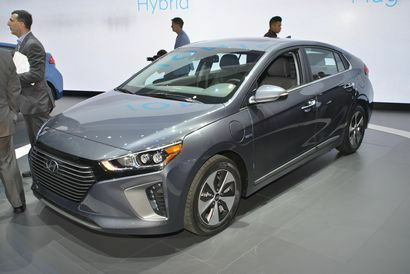 The Ioniq Hybrid features Hyundai's new Kappa 1.6 direct-injected Atkinson-cycle inline-four with a thermal efficiency of 40 percent. Producing 104 horsepower and 109 lb.-ft. of torque (both estimated), unlike most of its CVT-equipped competition, it's mated to a 6-speed double-clutch transmission. 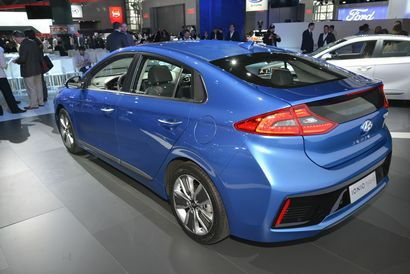 The hybrid's electric motor delivers an estimated 32 kW (43 horsepower) with maximum torque estimated at 125 lb.-ft. An electric-only driving mode will offer instantaneous torque at low speeds, with available power-assist at higher speeds. The motor is powered by a lithium-ion polymer battery (located under the rear passenger seat) with a capacity of1.56 kWh. The combination offers an estimated total system output of 139 horsepower. 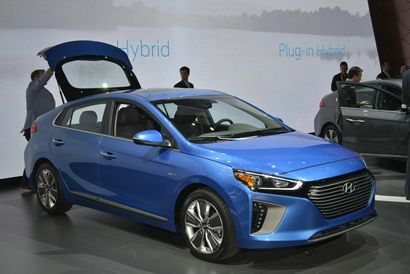 The Ioniq Plug-In Hybrid shares the same internal combustion engine/transmission combo with the hybrid model, but features a larger 8.9 kWh lithium-ion polymer battery along with a more powerful 45kW (60 horsepower) electric motor (both estimated) for an all-electric range estimated at more than 25 miles. The 2017 Ioniq Electric features a 28 kWh lithium-ion polymer battery for an estimated driving range of 110 miles. Estimated maximum output of its Electric motor is 88 kW (120 horsepower) and 215 lb.-ft. of torque that's delivered to the front wheels via a single-speed reduction gear transmission. 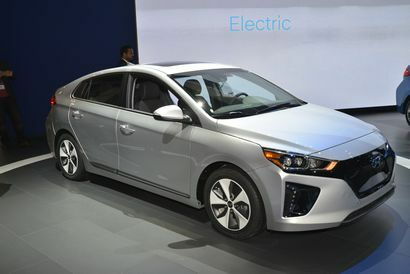 The Ioniq Electric has an estimated 125 MPGe rating. A 20 minute charge, using a SAE Combo Level 3 DC, 100 kW fast-charger will charge its lithium-ion polymer battery up to 80 percent, while an integrated In-Cable Control Box (ICCB) will allow drivers to charge an Ioniq at a standard household electric socket. 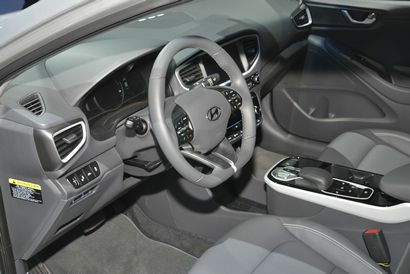 According to Hyundai, all technical specifications and emission values are preliminary target values and subject to homologation.